Gary Zaruba – a man of many talents who taught art for nearly 40 years at Kearney State College, now University of Nebraska at Kearney (UNK) – was an art educator, an artist, a carpenter, a collector, a scholar, an entrepreneur, and a volunteer. He was also a proud husband, father of two daughters, grandfather of three, and devoted patriarch of his extended family. Born on a farm near Belgrade, Nebraska, Zaruba grew up in nearby Fullerton. Although he had the ability to draw well, he never had the opportunity to take art classes in primary or secondary school. After graduating from high school, he worked as a construction drywall installer traveling from state to state and drawing in his motel room at night. Zaruba took his first art class a few years later when he entered the University of Omaha (now University of Nebraska at Omaha) where he earned a Bachelor’s degree in Art. He also was awarded an M.S. degree from Kearney State College, and an Ed.D. degree from the University of Nebraska-Lincoln. Following completion of his undergraduate degree, student teaching, and a graduate assistantship, Zaruba joined the Art and Art History Department at then Kearney State College in 1965 and four decades later became Professor Emeritus upon his retirement at the end of 2004. During his academic career, he mentored hundreds of art students and future artists. While researching American art history, Zaruba noticed that art historians recognized art which appeared almost entirely in major metropolitan areas. It was as if art never existed or took place in Nebraska, and this oversight motivated him to study Nebraska art, eventually becoming the leading scholar of 19th century Nebraska art. In 1975 he wrote a concept paper for a Nebraska arts center at then Kearney State College that was the basis for discussions by a College and community committee leading to the eventual establishment of the Nebraska Art Collection, the forerunner of the Museum of Nebraska Art (MONA). He served on the Board from its inception in 1976 until his death in 2014, holding the office of Treasurer for a number of its formative years. Research grants, official acknowledgement of the collection by the Nebraska Legislature, and scores of meetings with everyone from local service groups and donors to state art leaders consumed Zaruba’s time for years. Plenty of sweat equity was involved too as he helped to renovate the former Kearney Post Office into exhibition spaces after the building was acquired in 1986 to house the growing art collection. Zaruba served as MONA’s Co-Director from 1976 to 1979 and Director twice: 1986 to 1988 and 1997 to 1998. He was instrumental in establishing MONA’s Bison Society in 2008, dedicated to researching and honoring Nebraska’s 19th century art and artists, and started a Monday morning volunteer group to organize the Museum’s Library and conduct research. Zaruba had a deep and passionate interest in Native Americans and collected art and artifacts of the Plains tribes. He was also a knowledgeable collector of vintage decoys and other hunting and fishing collectibles, and built an antique fishing lure collection of regional note. He constructed a home which overlooked a lake near the Platte River which was home to him and his wife for many years. This led to another remarkable achievement – logging an impressive count of over 20,000+ game bird neck band identifications, and recognition by the Canadian Wildlife Service and U.S. Fish and Wildlife Service for his contributions to waterfowl conservation research on the Central Flyway. With all these activities, Gary also found time to research his family history, serve on the Kearney Nebraska American Legion Baseball Board, and advise the Kearney Veteran’s Memorial Committee. Together with fellow faculty member and MONA founder Larry Peterson, Zaruba owned a vintage print and frame shop. 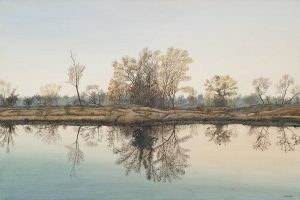 Over the years, the two friends acquired a large collection of 19th century wood and steel engravings focused on Plains images, which they generously donated to MONA in 2008. Appropriately, Zaruba’s exceptional record of accomplishments resulted in recognition. He received the prestigious Pratt-Heins Award for outstanding faculty service from then Kearney State College in 1989. The Kearney Hub newspaper honored him with its Freedom Award in 2007. Zaruba along with Larry Peterson, Jack Karraker, and Harry Hoffman were recognized by the Kearney Area Community Foundation in 2010 for the founding of MONA. In 2012, Zaruba, Peterson, and Karraker received the Roscoe Shields Service Award from the Nebraska Art Teachers Association. The MONA Board of Directors named the Museum’s Library as the Gary E. Zaruba Library and Research Center in January 2014 – an honor that was close to his heart. As an artist, his works reflect creativity, interest, and exploration of a variety of styles and media. Hand-built pottery, soft-edge abstraction, insect and butterfly motif paintings, public artwork cranes, and most notably his Nebraska landscapes display a wide-ranging artistic output that won many awards and honors. Finally and importantly, Zaruba emphatically closed a gap in art history with his cultural legacy, the Museum of Nebraska Art, and showed that significant art did and does occur in Nebraska. Dr. Gary E. Zaruba died in Kearney, Nebraska in October, 2014. The Museum of Nebraska Art has 12 works by Gary Zaruba.